Opioids Research – An article by Richard Victor of WCRI is featured in CFO – Five Ways to Curb Workplace Drug Risks – “Significantly reducing the use of unnecessary narcotics in the treatment of injured workers is the task of all stakeholders in the workers’ compensation system: employers, labor, physicians, hospitals, insurers and public policymakers. But reforming a statutory system like workers compensation takes time. Fortunately, employers can take some beneficial actions immediately. A look at the latest research provides the insight needed for all to do the right thing. The WCRI study, Longer-Term Use of Opioids, identified a number of states where workers were most likely to be taking opioids long after their injury.” Also see: Preliminary data from Joe Paduda’s Opioids in Workers’ Comp survey. Healthcare violence – NIOSH offers free free on-line Violence Prevention Training for Nurses. NIOSH partnered with nursing and labor organizations, academic groups, other government agencies, and Vida Health Communications to develop the training, which incorporates text and videos depicting workplace violence incidents, testimonials from real nurses, and module quizzes. Nurses can also receive free continuing education credits for completing the online course. The course has 13 units that take approximately 15 minutes each to complete. Heat Kills: As temperatures climb, workers succumb to heat at The Pump Handle. Intoxication and Workers Comp – New Hampshire Court Outlines Drunk Defense in Workers’ Comp Claims – intoxication must be determined to be the cause of an accident for it to be a defense against a workers’ compensation claim. Roberto Ceniceros discusses more on this case at Comp Time and raises some additional issues. He notes that the claimant’s argument was that the employer should have known he was drunk because he is an alcoholic. The claimant is now also a quadriplegic as a result of the accident. More news briefs below, but first we thought we would offer this newly restored documentary of seismic events from 50 years ago today: The March – 33 minutes of truly remarkable history. Putting a Cap On Physician Dispensing – An increasing number of states are putting into place measures to regulate physician distribution of prescriptions. The Challenges of TRIA Reauthorization – The fight for TRIA extension is looking to be a messy one. 10 Employee Conversations That Managers Hate to Have – links from credible sources to some practical guidelines for each conversation. Is a Hair Salon the Statutory Employer of a Barber? A widow seeks benefits after her husband died during a robbery at the salon. Drop in N.H. worker comp payments leads nation – 21.7% decline comes as national average payouts increase. Industry’s Victims in Bangladesh – Reuters photographer Andrew Biraj’s moving photographs of survivors of the Rana Plaza collapse. Check out the recently posted Cavalcade of Risk #190 – August 21st, 2013 Edition posted at the My Personal Finance Journey blog. And watch this space for the next risk roundup, which we’ll be hosting here! Catch up on your Health Wonkery – David Williams has posted Health Wonk Review: Dog Daze 2013 over at Health Business Blog. Judging by the number and variety of entries, it would seem the health wonkers have not been vacationing! 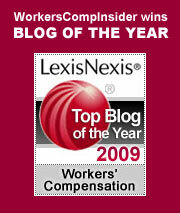 Opioids, Workers Comp & iPad Minis – Are opioids a workers compensation issue for your organization? Joe Paduda is seeking participation in his online Survey of Opioids and Workers’ Compensation. You can further our industry knowledge in this area – and potentially win an iPad Mini for your participation. Who should participate? Industry vendors, Insurance Carrier/Providers, Managed Care Organizations, Medical Communities, Third Party Administrators. Hotshot Firefighters & Workers Comp – At Comp Time, Roberto Ceniceros discusses workers comp issues related to the Arizona Firefighters who recently lost their lives in this year’s mega fire. There are coverage issues of part-time vs full-time workers at issue – one surviving widow is challenging the denial of benefits. In his post, Ceniceros also pointed us to this excellent article: Deaths in Idaho and elsewhere prompt agencies to reform how they protect firefighters. Happier times ahead? – Joe Paduda says that if higher total premiums are your barometer, things are looking decidedly sunny: Brighter days for workers comp. And related to these happier times that Joe notes is the resurgence of manufacturing. See : Are Engineering Schools the Unsung Hero in America’s Industrial Rebound? WV “epicenter of the Oxycontin epidemic” – Ken Ward talks about Coal’s role in Appalachia’s drug problem. His post also points us to the documentary Oxyana, which is described as. ” A portrait of Oceana, WV, an old coal mining town that has become the epicenter of the Oxycontin epidemic, earning the nickname Oxyana.” You can see the Osyana trailer here and click through to watch the entire documentary online for $3.99. Related: At CompTime, Roberto Ceniceros recently wrote about Heroin and the Work Comp Connection. He’s also written about about a shift away from OxyContin use toward heroin abuse. Obesity and workers comp study – In light of the recent AMA classification of obesity as a treatable disease, the California Workers’ Compensation Institute (CWCI) has issued a report that examines the effect on California workers’ compensate. “Using data from 1.2 million claims from accident years 2005 to 2010, the Institute found that claims with an obesity co-morbidity have had significantly higher rates of lost time from work, permanent disability, and attorney involvement, and have been much more likely to involve additional co-morbidities such as arthritis, hypertension and mental health issues, as well as prescriptions for opioid painkillers and psychotropic drugs – all of which are associated with higher claim costs. Indeed, after case-mix adjustment, the study found that paid losses on claims with the obesity co-morbidity averaged $116,437, or 81.3% more than those without; and that these claims averaged nearly 35 weeks of lost time, or 80% more than the 19 week average for claims without the obesity co-morbidity. The Institute notes that to the extent that such differences continue in the future, these results suggest that any increase in the number of job injury claims in which obesity is treated could have significant cost implications for workers’ compensation.” Access the full 8/7 report at CWCI. Fraud corner Jon Gelman reports on an Illinois first: Employer Convicted of a Felony for Failure to Have Workers’ Compensation Insurance. Risk Roundup – Cavalcade of Risk # 189: What’s Going On In The World Of Risk – Check it out! The best resignation letter ever written?